Stuart Circle in the Fan district of Richmond, Virginia, with a view of the First English Lutheran Church that was built back in 1911. 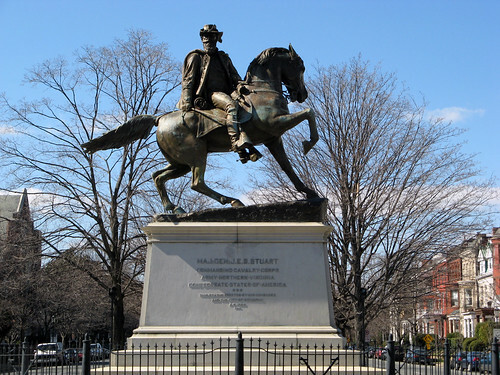 An equestrian bronze statue 15 ft. high mounted on a granite pedestal 7 ½ ft. high embodies the Confederate States Army general of the American Civil War. The statue faces north and is the most animated of the Monument Ave statues. It was dedicated May 30, 1907.